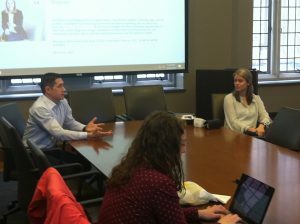 Miss today’s Learn IT @ Lunch session “Woulda, coulda, shoulda: Nifty tech tips from the Duke Community”? A recording is available online. Note: You may be prompted to update your MS Silverlight Plug-in to view the recording. Session slides are available online at: https://duke.app.box.com/v/nifty-tech-tips. 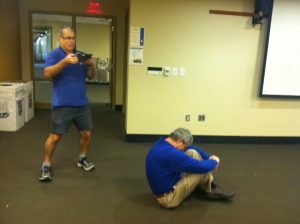 Miss yesterday’s Learn IT @ Lunch session “Protecting yourself against identity theft”? A recording is available online. Note: You may be prompted to update your MS Silverlight Plug-in to view the recording. Session slides are available via Box. Our presenter John Shaw, University IT Security Office. Q&A session at the end of the program. 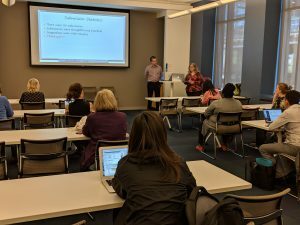 Miss today’s Learn IT @ Lunch session “Adventures in PDF and Document Accessibility”? Check out the Duke Web Accessibility website for information and resources. Have questions? Contact us. 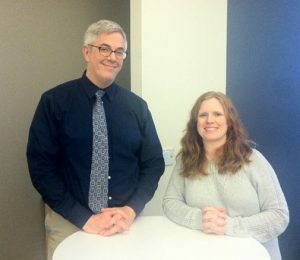 Our presenter Joel Crawford-Smith (OIT) assisting Steve and Susan from Duke’s Pathology Office. 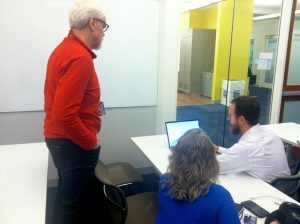 Miss yesterday’s Learn IT @ Lunch session “Making Informed Decisions: Google Analytics Crash Course”? A recording is available online. Note: You may be prompted to update your MS Silverlight Plug-in to view the recording. Registration is not required. Lunch is not provided. 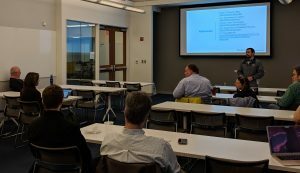 Miss today’s Learn IT @ Lunch session “Wearable healthcare devices and your health” ? A recording is available online. Session slides are available to download via DukeBox. Also, visit the Duke Mobile App Gateway website for more information and workshops. 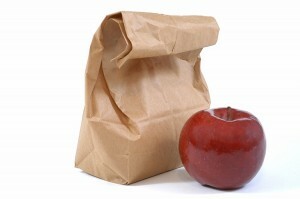 The Spring 2019 OIT Learn IT @ Lunch schedule for has been posted online: https://sites.duke.edu/training/learn-it-lunch/. Topics include: Qualtrics, Wearable Health Devices, Google Analytics, & more. Save the dates on your calendar! No registration. Feel free to bring a brown bag lunch with you. We want your tech tips! Which keyboard shortcut has changed your life? What software can you not live without? 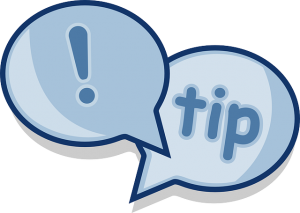 What tech tip would you tell a newly-hired employee or give an incoming freshman? 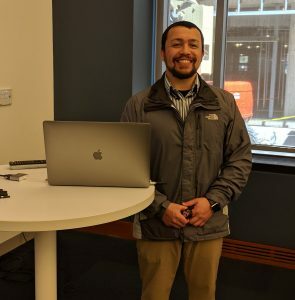 In April, we will have a special Learn IT @ Lunch session where we will share tech tips that we are gathering from members of the Duke Community, like you. Tips can be submitted through this Qualtrics survey. If you submit a tip, look for a small prize from OIT in your Duke campus mailbox. 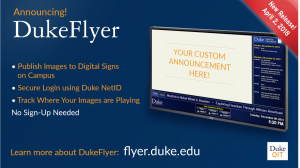 Miss last week’s Learn IT @ Lunch session “Promoting events & services at Duke with Digital Flyers (DukeFlyer 2.0)” ? A recording is available online. Note: You may be prompted to update your MS Silverlight Plug-in to view the recording. 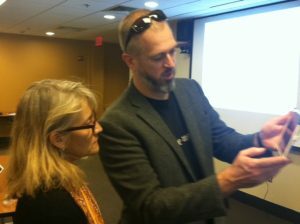 Missed the recent Learn IT @ Lunch session “High Resolution 3D Scanning for Research and Education”? Check out the session slides (PDF). Participants having fun 3D scanning!